A few months ago Luke and I decided to go to a professional box lacrosse game downtown Rochester. It was a great learning experience for me and a lot of fun too. For more on this see Rochester Box Lacrosse. 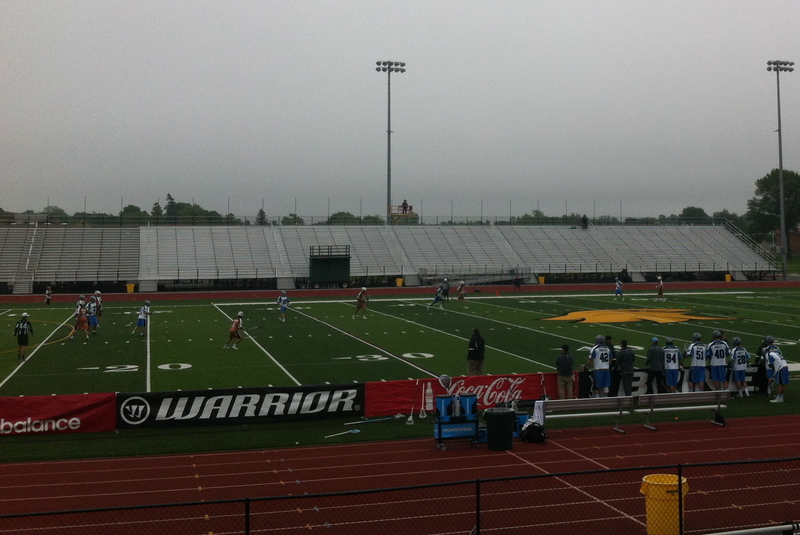 After enjoying our groupon for the box lacrosse game we decided to get tickets to a professional field lacrosse game in order to see the differences and find out which we enjoy better. When I bought the tickets I thought through the summer time and decided the end of June would be sunny enough to enjoy an outdoor sport. Well, not this summer. 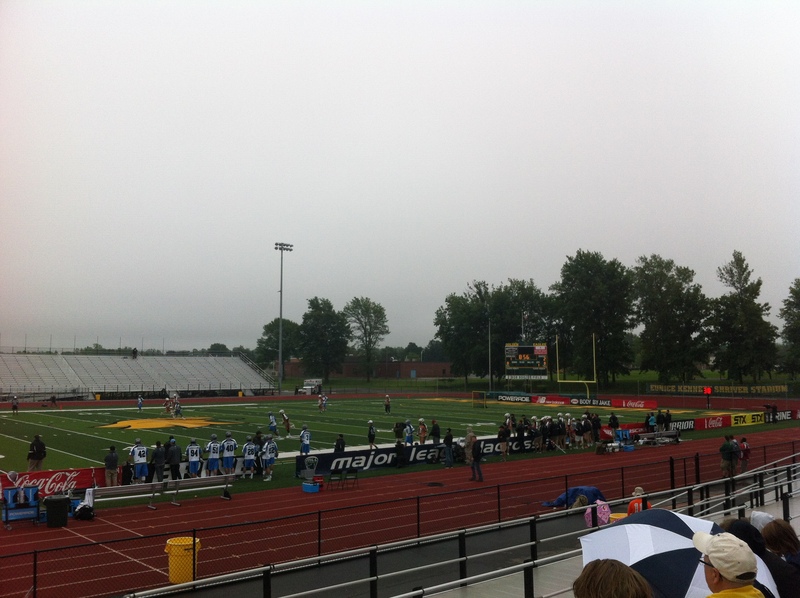 After checking the weather, the stadium website, and the Major Leauge Lacrosse website, nothing was canceled. So we packed warm clothes and rain coats and headed to Brockport, a neighborhood west of Rochester. When we got to the state university college campus it was overcast but not raining. We walked over to the stadium just at the national anthem finished and got our tickets. 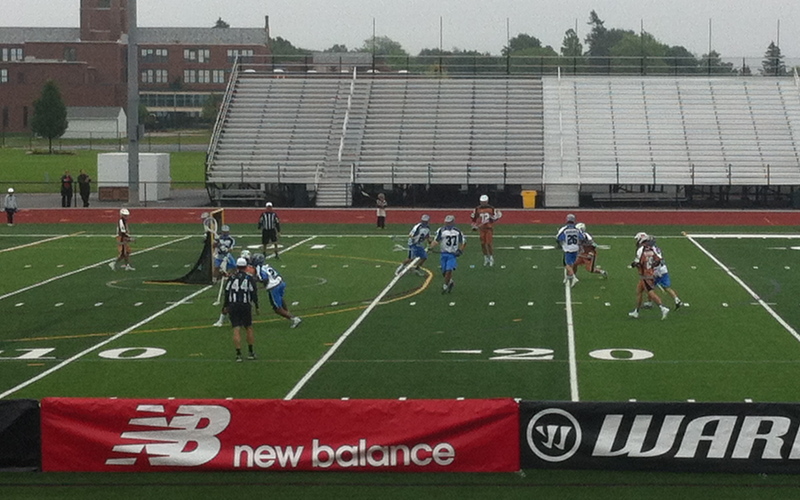 Watching the game we noticed several differences from our box lacrosse experience. The teams had more players on the field at one time and of course the field was longer. Because of this similar to soccer some players played defense and some offense. The goalies were in less padding and gear but had larger nets. Also in general this version was less aggressive, less offense attaching and more running and passing. We were grateful that the ball was a bright orange because it would have been hard to see otherwise. Luke said he missed the big screen to capture the moments closer and to get play-backs of what happened. Also unlike the box lacrosse this game was much slower paced partly because the the game was televised on an ESPN channel the game was stalled often by commercials after time outs. During time outs the announcers went through a short list of advertisements, the same ones, each time. No one seemed to have their full attention on the game. 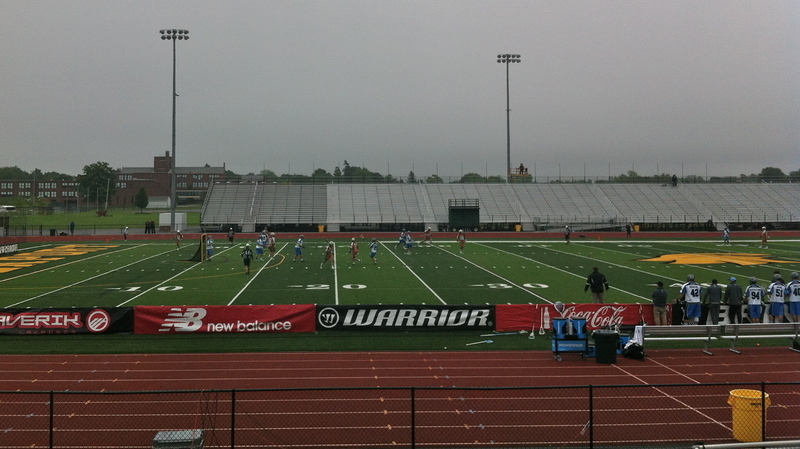 The audience was mostly families with young boys who had played a lacrosse game on the same field before the professional game got started. The local cheer/dance group for the local team were very unprepared and unprofessional.. Overall we are glad we went. 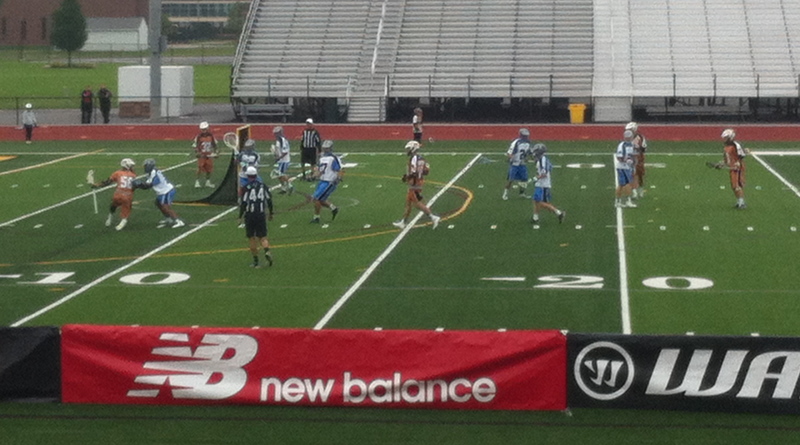 It was good to see the differences and to learn that it is obvious the box lacrosse is much more popular around here. 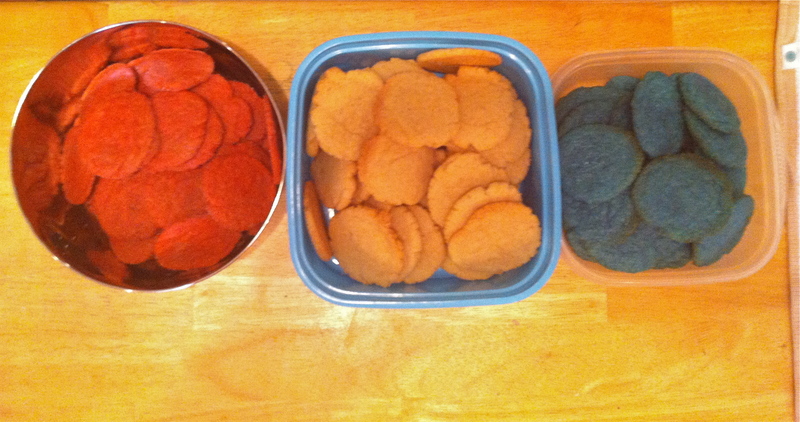 As I mentioned in my Birthday Fun post I decided to make myself several bday treats. 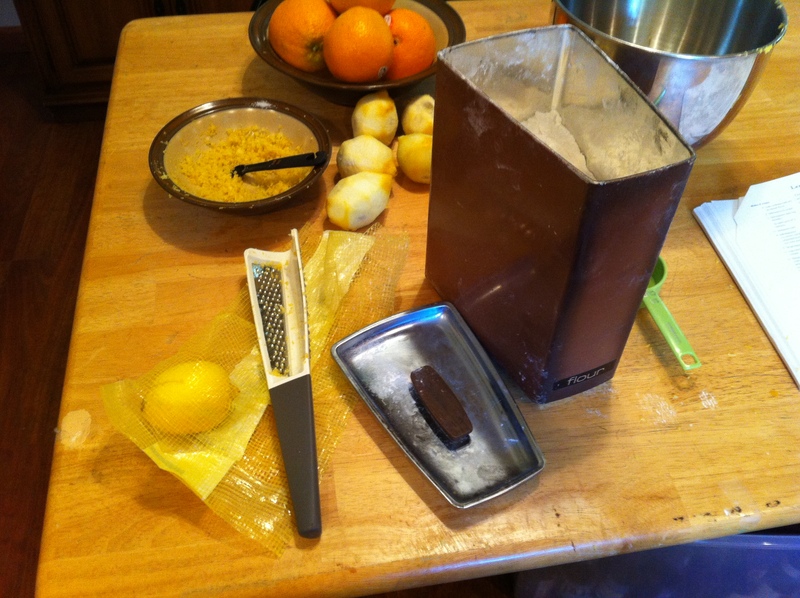 I have often used, as some of you may know, the Bread Bible as my guide for new recipes or new forms of baking. 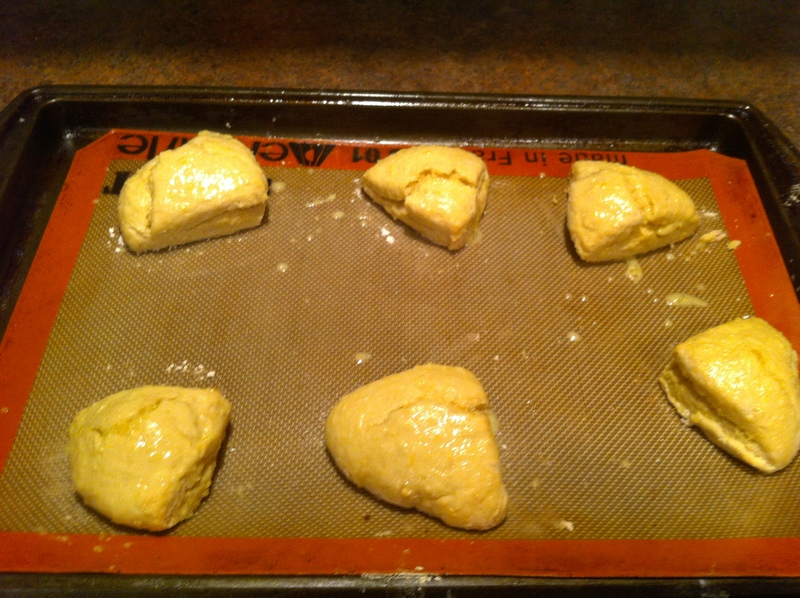 Since this was my first time making scones I thought I’d use their recipe to get me started. It didn’t hurt that it was for lemon scones. Also, not so surprising I made a few changes. 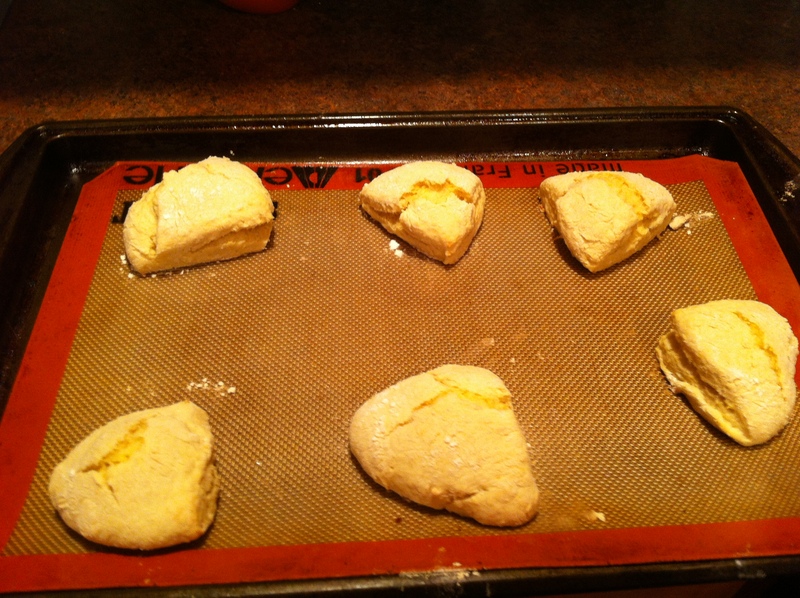 The original recipe called for putting a little cinnamon sugar on top of the scones. I opted for a glaze instead. 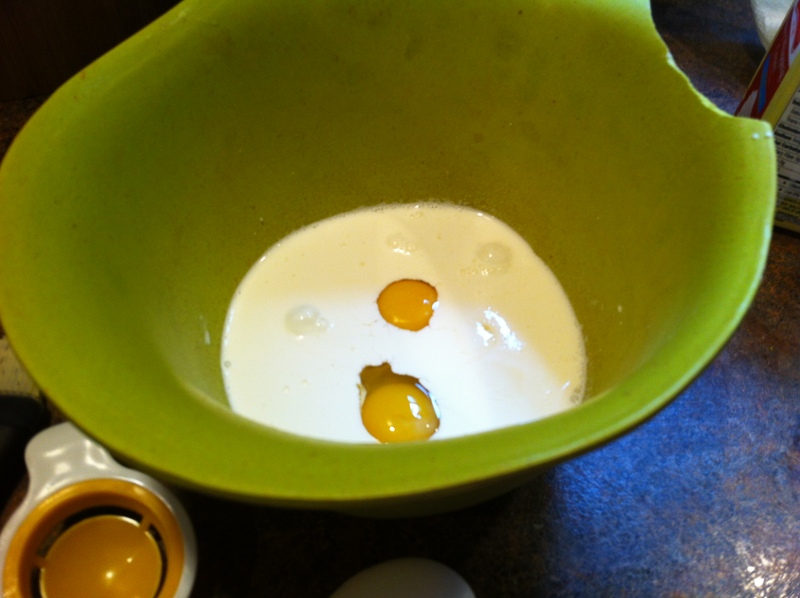 I also added more sugar and lemon to make these more or a treat and less of a mild breakfast. 1. Preheat oven to 400 F. I put my down to 375F because my oven runs hot. 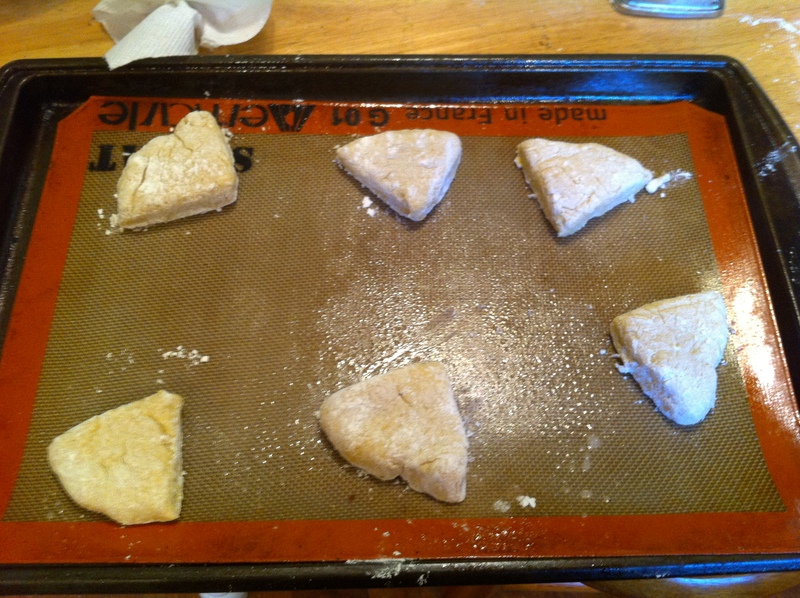 1-2 baking sheets. 2. 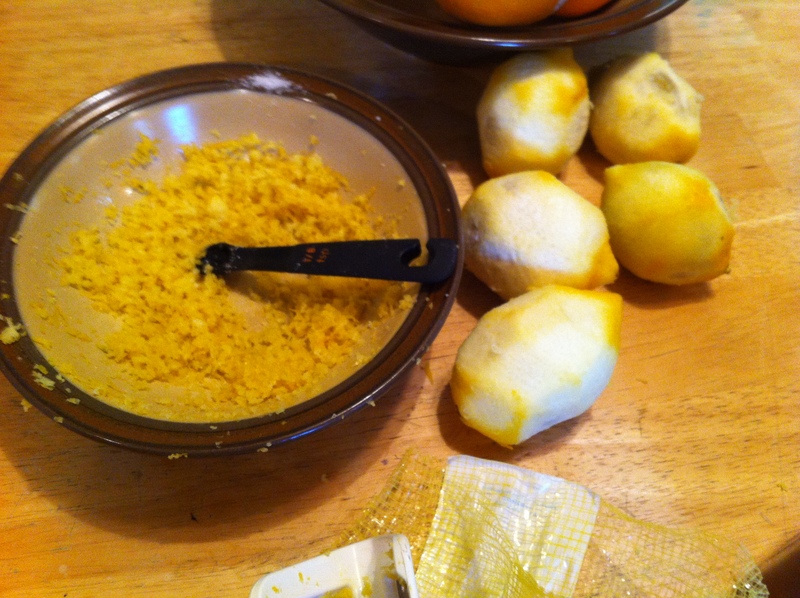 In a medium bowl combine flour, sugar, baking powder, lemon zest, and salt. 3. 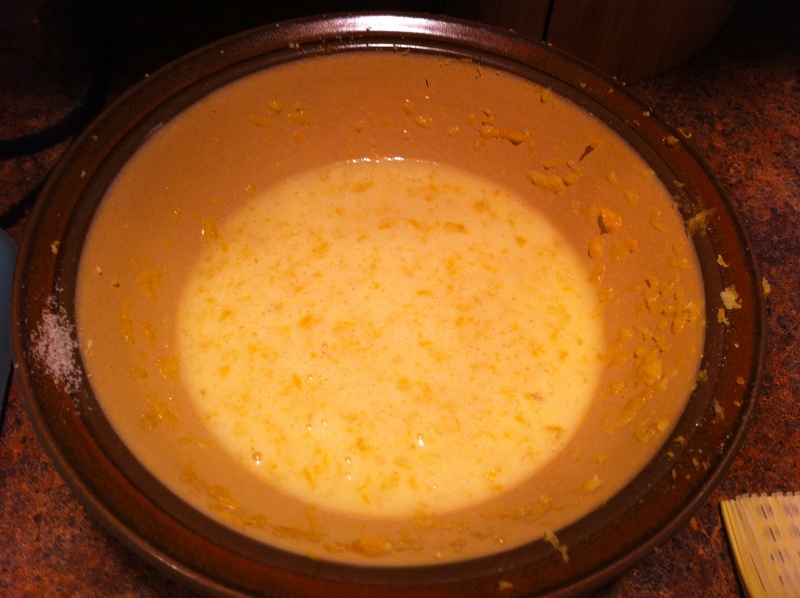 Cut in the cold butter with a knife and mix together until it crumbles. 5. 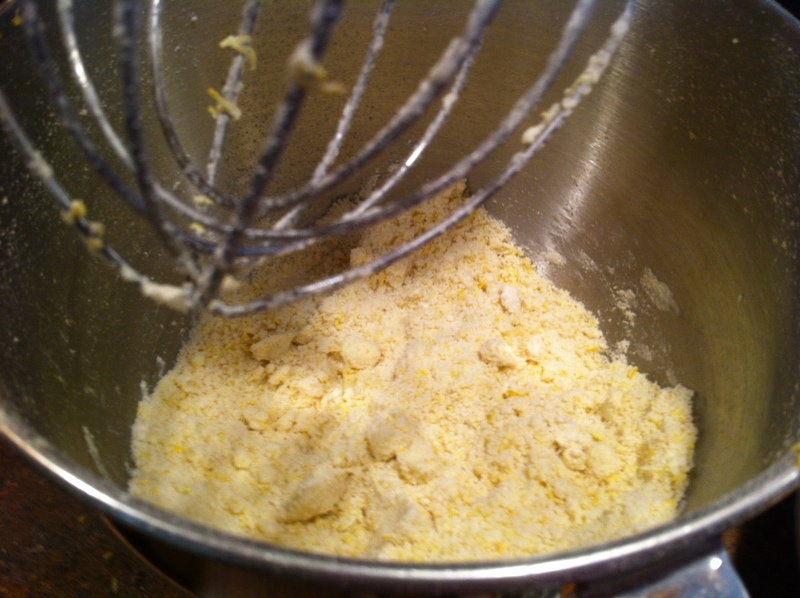 Put the dough on a floured surface and lightly knead. 6. 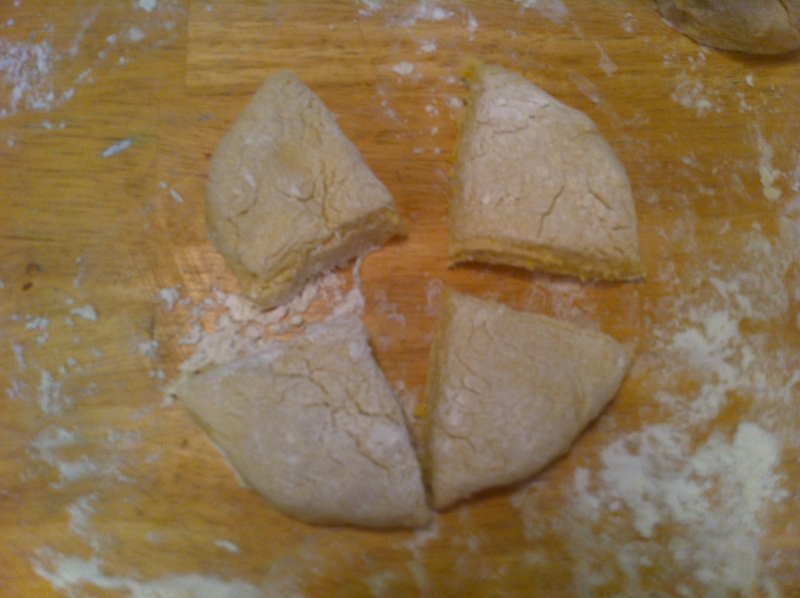 Cut the dough into three equal parts. 7. 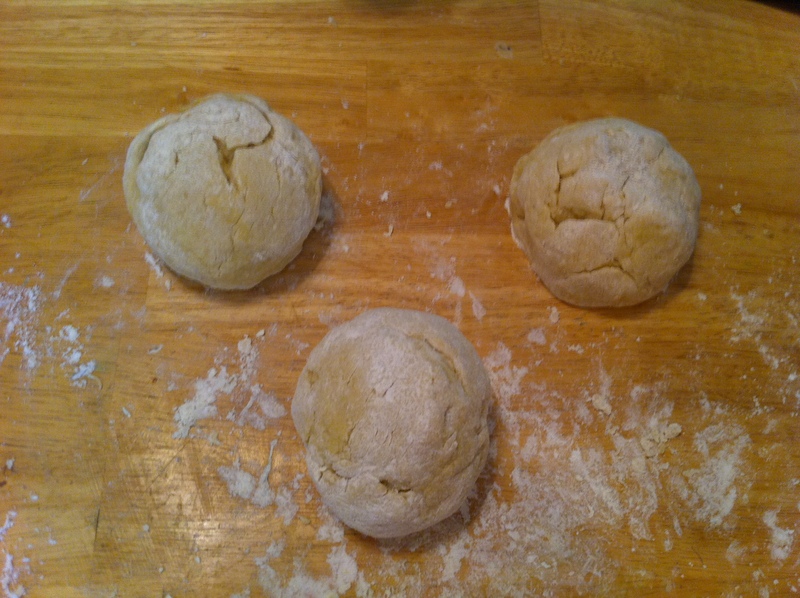 Use your cupped hands on the sides of the dough to turn the equal parts around in a circle until they form domes. I made my glaze and cleaned up while they baked. 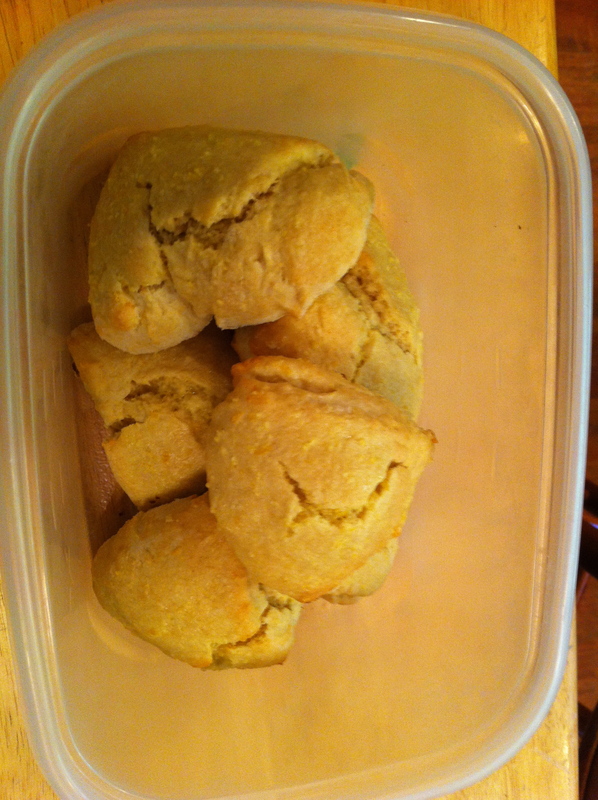 I found these scones to be a wonderful treat. 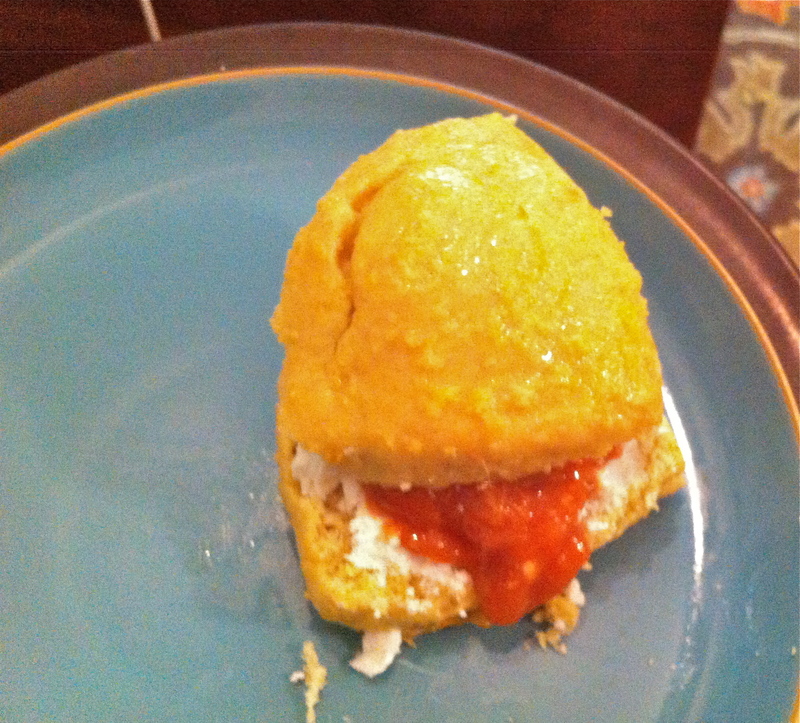 They were especially good with a little goat cheese and strawberry rhubarb jelly (more on the jelly to come). 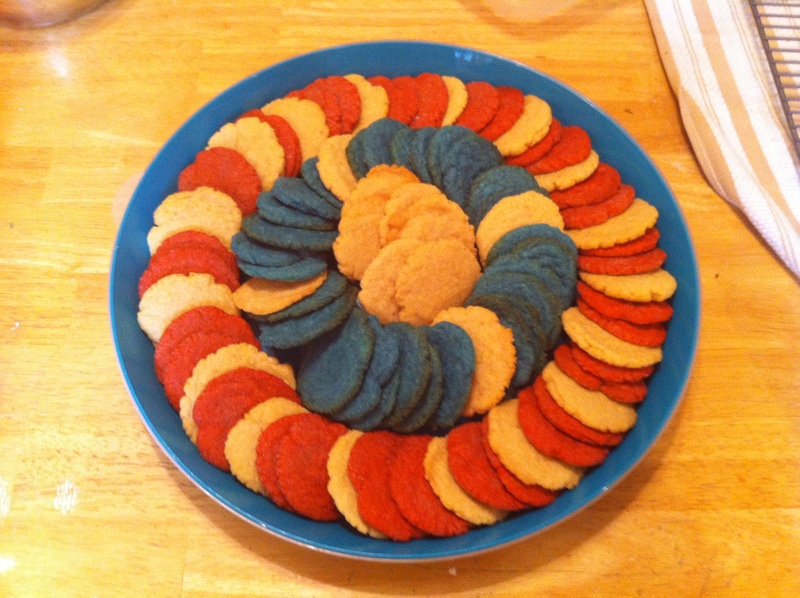 To celebrate this year I made new red white and blue cookies using the summer cookies jello recipe with a few tweeks (more on this to come). We also are doing a BBQ for two of hamburgers with homemade buns and baked potato wedges. Luke and I are enjoying the sun shine, finally. Whether you are enjoying time with your family or friends, having a BBQ, going to a concert, or watching fireworks I hope you all enjoy celebrating our nation’s independence. As I said earlier this week we have had a very wet summer so far. We love the rain, the sound, the fresh smell. But it makes it difficult to make progress on one of our garden. The outside of our home had been pretty neglected while waiting to be sold to us. We knew we couldn’t do much about it until spring/summer because of fall leaves or snow. But in the past few weeks when it has been dry we have started several projects. 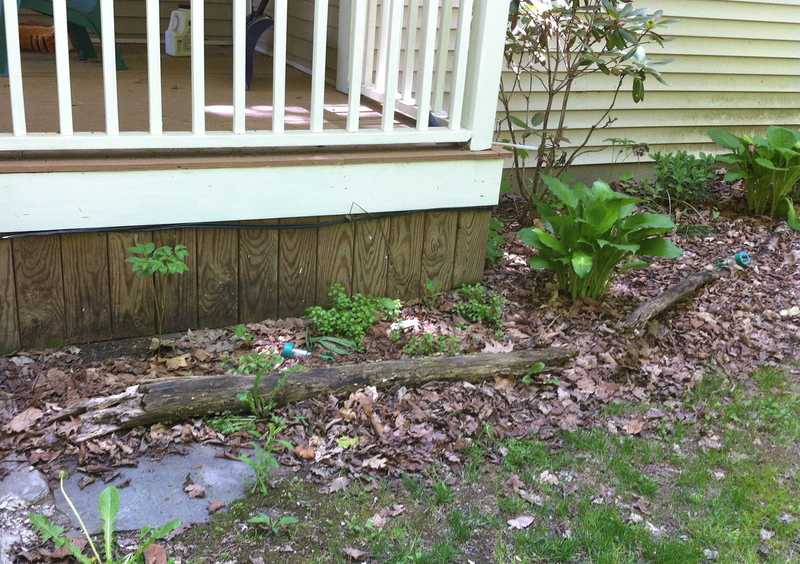 The front yard beds had been bordered with wood sticks from the property, uneven and rotting. Although we had cleaned out most of the leaves from fall a good layer had escaped us before snow hit. 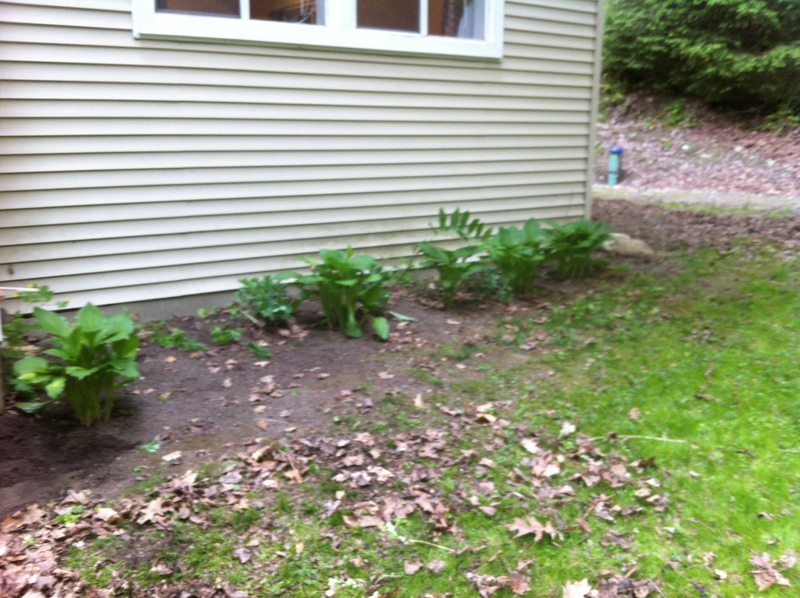 The beds had several perennial plants including hostas, some succlents, and wilting and rotting rodi’s. 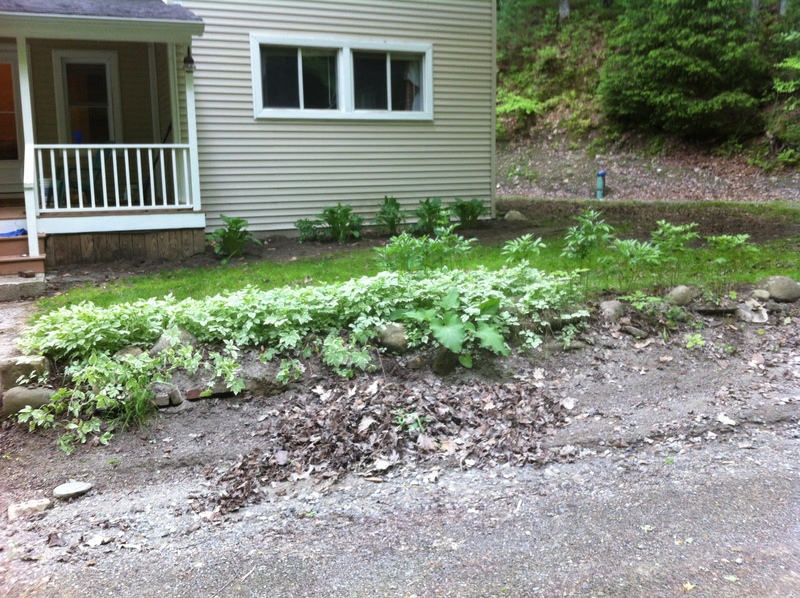 We also have a rock border seperating the road and our front lawn. 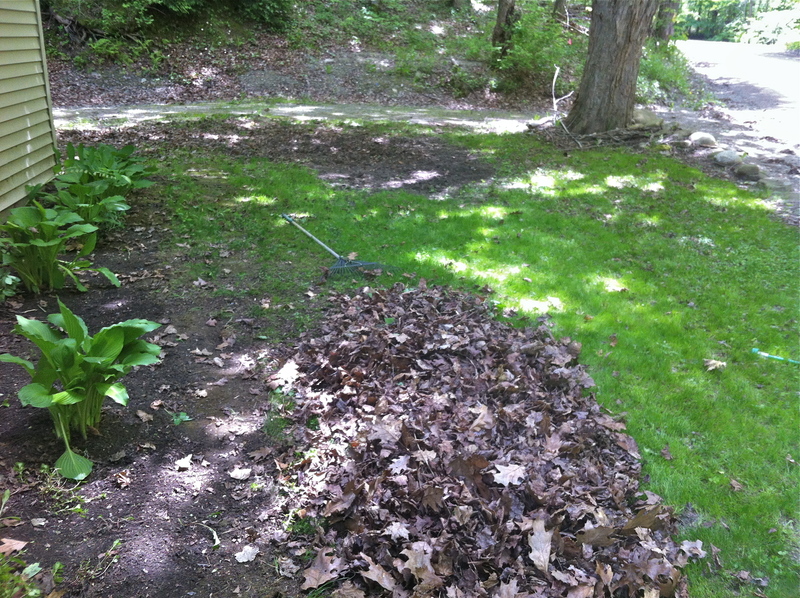 I clean this out from leaves, weeds, and moved a few needed rocks around. 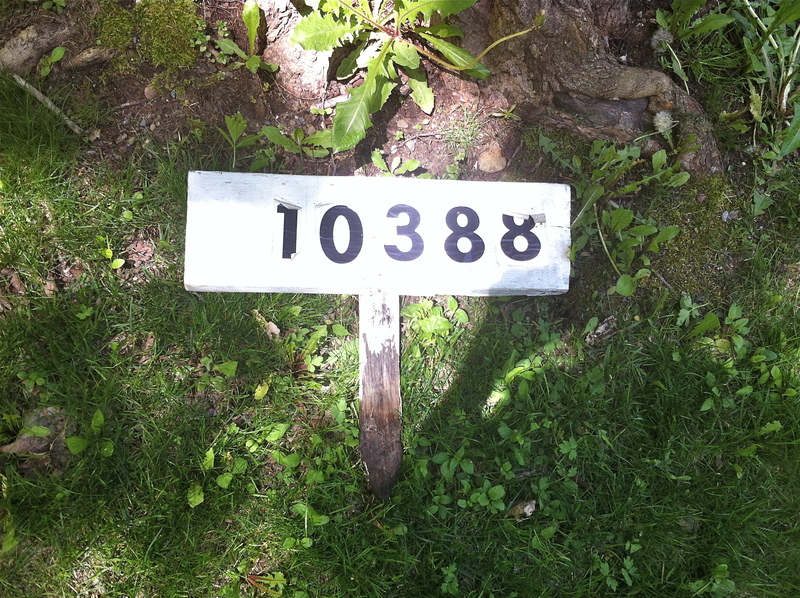 I also removed a rotting cheap address sign from the yard (we have our address on the porch post and mail box so it’s not needed). While doing this I found a variety of unsafe or unwanted items including broken glass, rusty nails or stakes, plastic pieces of old lawn decorations, old stake lights that no longer worked, and many plastic plant markers for annuals flowers that have long since died out. Once we saw what plants we had we decided to measure and redefine the planter borders. In doing this we realized their was a stone path that ran right under where we wanted to put our boarder. 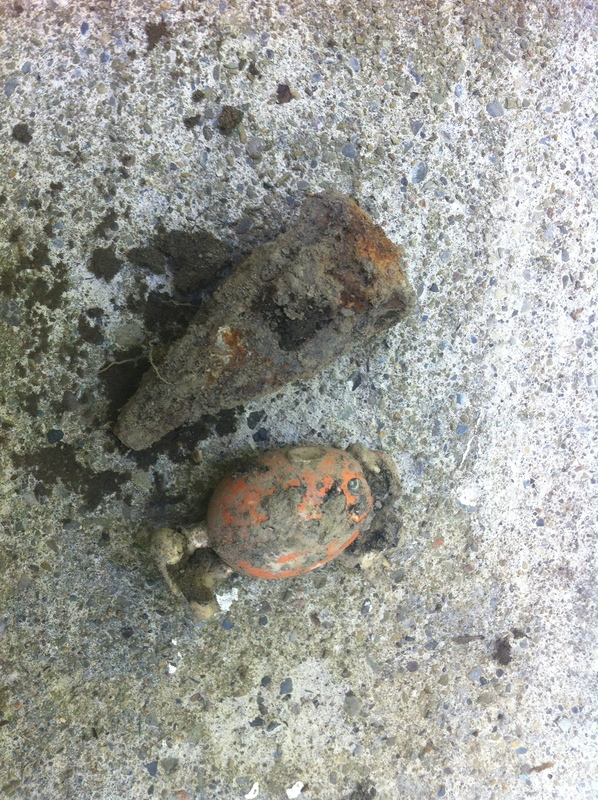 The path was buried under a half inch of grass, moss, dirt, and roots. So my next project was to tear the path up, which we discovered was cinder blocks painted yellow, green, and red. 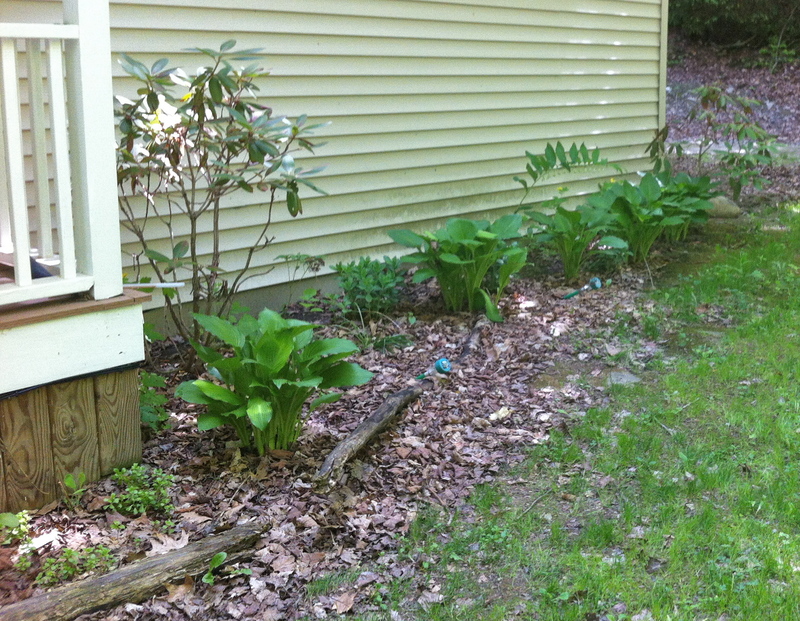 We think this path was created before the porch was made thus the odd angle. We have had too many wet days to make much more progress. But in spite of the lack of sun this week we have started to find new flowers or plants throughout the yard. 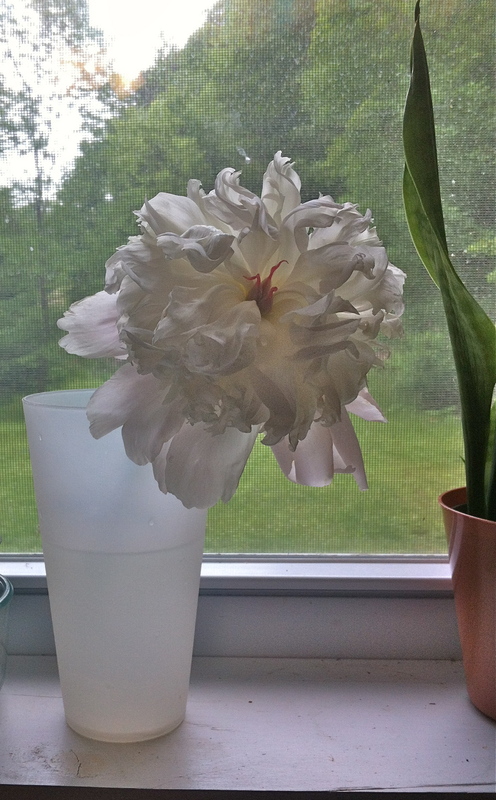 We have discovered we have peonies both in pink and white in the the front rock bed (which will need to be transplanted to get more sun and bloom). 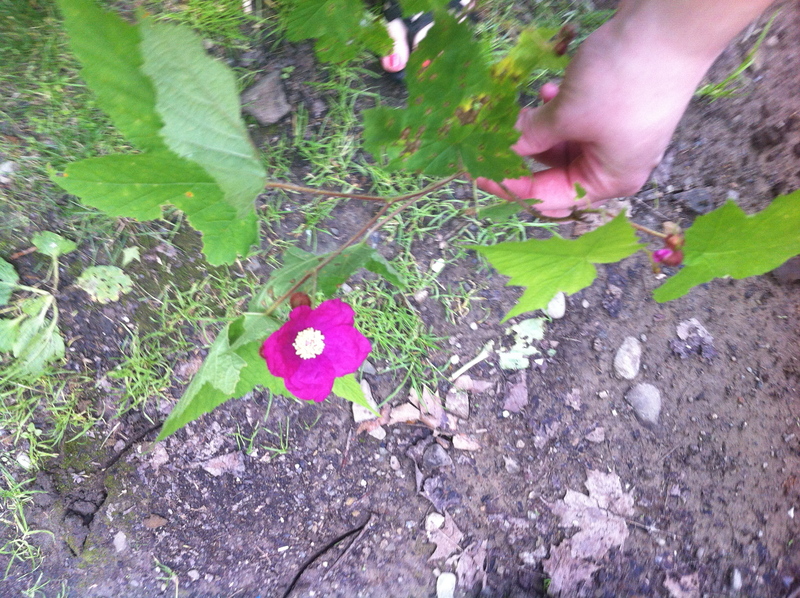 As well as we have flowering wild raspberry bushes all on our hill property. 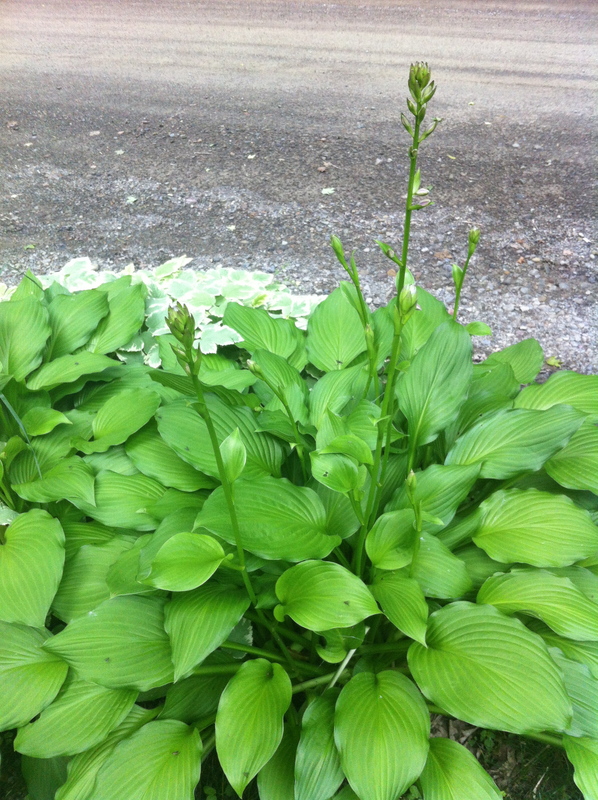 The hostas will soon also bloom what we believe to be lavender stock flowers.We are hoping for a sunny July so we can transplant, add new perennials to our front yard, and enjoy summer flowers blooming. My Spring semester of teaching ended mid-May, although grading and meetings continued after that life definitely slowed down. Then I thought I’d be teaching a 10 week ESL summer school but enrollment ended up being too low. So I have this summer off from work. As those with teaching jobs know there is joy and difficulty in having time off in the summer. Summer time gives teachers an opportunity to step back from their work, see the big picture, review student surveys, and see what needs to change for next semester. It also gives time to read new books on the teaching subject, on teaching methods, and attend professional development meetings. But it also means a lack of routine. I need more to do beyond making changes to curriculum and creating new class activities. I can “relax” without a routine for only so long before I’m caught up on Netflix shows. House warming: Even though we’ve been living here for more than 6 months a lot of necessary home maintenance items have come up and home decorating has continually moved to the back burner. Since we’ve had so much rain this month I’ve been able to get Luke’s help to fill holes, from previous owners wall hangings, touch up paint in the house, and plan house decorating. Even though Luke cares less about what I decorate with he is helpful, and more particular about the where. Which is OK because he’s more spacial than I am. Of course decorating projects will be shared as they get completed. Editing Website: I have been the editor in chief for my mother-in-law who is a self published book author for almost 4 years now. I started my own editing business more than a year ago but got busy with a move and new teaching job before I got to the advertising end of things. So I’m taking this summer to get my editing business on it’s feet with designing a website, logo, and making business cards. (More of this including a link to my new site to come). VBS/Bible Study: Since I’m not socializing with co-workers on a constant basis I realized I need to get out of the house and with people during the week. I decided to join the women’s Bible Study at our church. It meets on Tuesday mornings so I may not be able to continue in the Fall but it is good to be with these women. Plus we are using one of my mother-in-law’s books for the study. I also have volunteered to help out with our churches’ VBS heading up the missions projects. I will be explaining to the kids and how they can help raise money or collect cans for humanitarian needs in Nepal and Latin America. Curb Appeal: We had a late spring and as I said earlier a wet summer but we are finally learning what plants we have in the front yard. 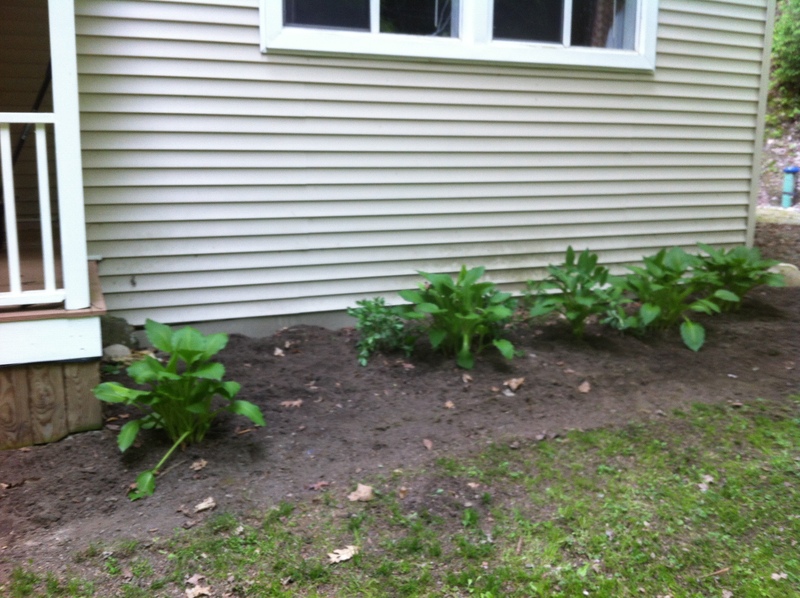 I am working to clean up the front yard and garden beds around the house: weeding, cleaning out leaves, categorizing plants, transplanting plants , and buying new plants to add color and interest to our front yard. It has been a great learning experience since I’m not used to working with such moist and shaded ground. (more blogs on this to come). 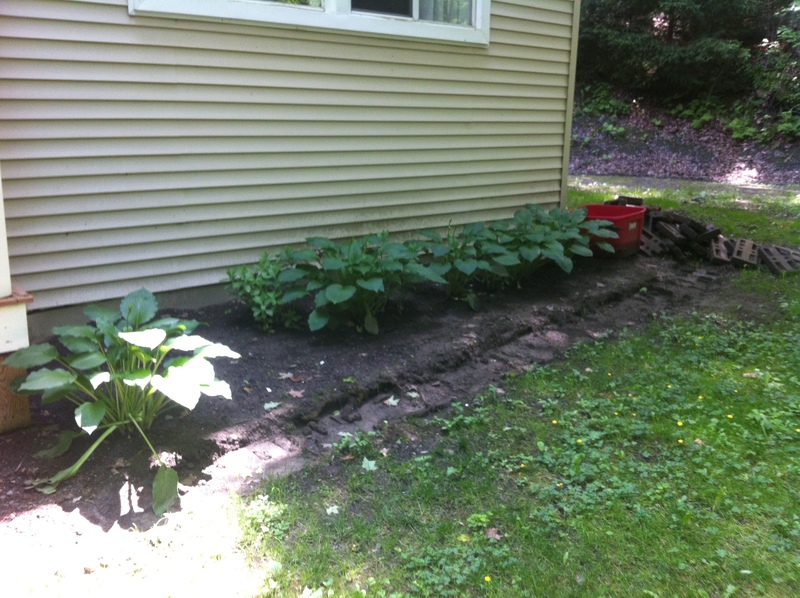 Garden/Yard: This project Luke is leading right now. Because we live in a very shaded valley we need to clear trees and brush in order to create sunlight for a garden. Luke has been working in the yard to kill weeds, cut down trees, and do controlled burns on one of the hillsides of our property to create a garden space. 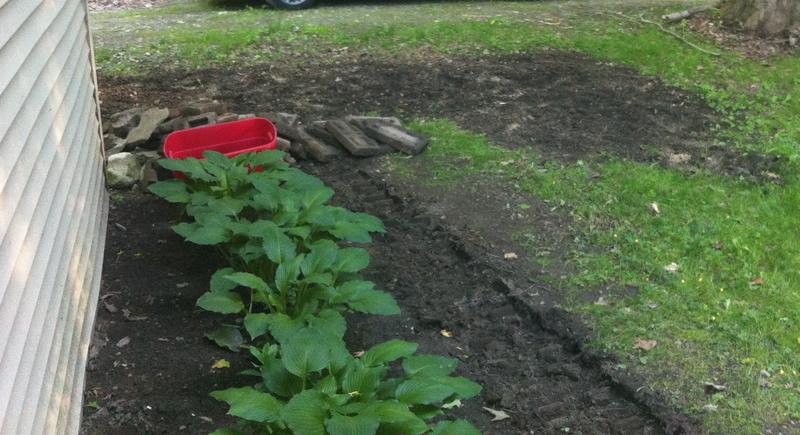 We are hoping for a late summer/fall gardena. So this is how I am staying busy this summer. What are your summer projects?